Home news Why Nigerian govt reinstated fugitive ex-pension chief Maina. Why Nigerian govt reinstated fugitive ex-pension chief Maina. Nigeria’s Minister of Interior, Abdulrahman Dambazau, has reacted to an exclusive reporters story on how the federal government reinstated a sacked civil servant despite a pending corruption trial. Reporters on Friday reported how controversial chairman of the defunct Presidential Task Force on Pension Reforms, Abdulrasheed Maina, was secretly recalled to the service and promoted to head a directorate in the Interior ministry. Mr. Maina was in 2013 declared wanted by the Nigeria’s anticorruption agency, Economic and Financial Crimes Commission, EFCC. Checks by reporters show that Mr. Maina is still on the commission’s wanted list. 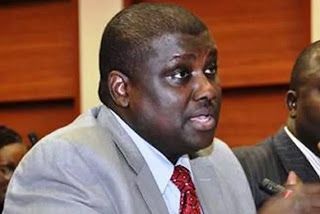 “Dark complexioned Maina is allegedly complicit in the over N 2 billion Pensions Biometric Scam in the office of the Head of Civil Service of the Federation. He remains at large, after charges were filed against his accomplices,” the EFCC stated on its website. Mr. Dambazau, in a statement by his press secretary, Ehisienmen Osaigbovo, confirmed that Mr. Maina is now in charge of the Human Resources Department of the ministry. The minister however denied responsibility for Mr. Maina’s recall to the service. The statement explained that Mr. Maina “was posted few days ago to the Ministry of Interior by the Office of the Head of Service on an Acting capacity to fill a vacancy created following the retirement of the Director heading the Human Resources Department in the Ministry”. The minister blamed Mr. Maina’s recall on the Office of the Head of Service of the Federation and the Federal Civil Service Commission. The statement did not say if Mr. Dambazau was aware Mr. Maina is still a fugitive wanted by the EFCC.